When non-surgical treatments fail to provide adequate relief from the symptoms of arthritis, your orthopedic surgeon may recommend joint replacement. 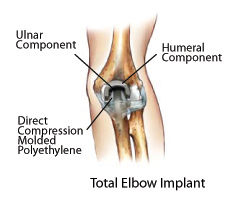 The technique of joint replacement uses implants typically made from polyethylene (plastic) and metal alloy to replace the damaged sections of bone and cartilage in the joint. The purpose of the procedure is to restore function and mobility and to provide relief from joint pain. You must decide if your discomfort, pain or stiffness, and overall loss of quality of life justify undergoing surgery.